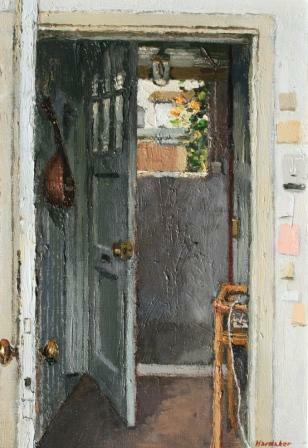 ''Open Doors '' Late Afternoon'' is an enigmatic painting. There is a sense that someone may have just stepped out of the artist''s studio for a moment. Leaving the door open we see the warm afternoon light outside while the hallway is in shadow. A study in texture, Charles Hardaker shows his fascination with light and shade and the depth they can create. His attention to detail and the way he always finds beauty in the ordinary lends Charles Hardaker''s artwork a meditative quality.